Caley Thistle's George Oakley is raring to go in the Highland derby. All George Oakley has wanted to sample since joining Caley Thistle is the Highland derby. Oakley is back involved after missing the last six weeks with a hamstring injury and is determined to make up for lost time by proving his worth against Inverness’ local rivals Ross County. 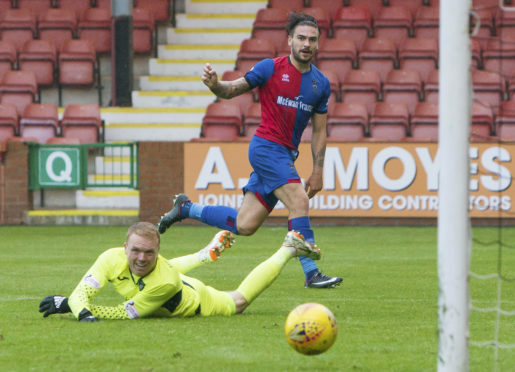 The Caley Jags come into the game seven points adrift of County but unbeaten in 22 games, although goalscoring has been a problem for John Robertson’s side. Oakley is convinced he can help remedy that problem now he is fit again and hopes to finally sample the biggest game in Highland football. He said: “It’s a big game for everyone up here and since everyone has spoken about it, it’s all I’ve really wanted to play in. I want to feel the atmosphere and passion and it’s what I’ve been looking forward to the most. “I’m a player who loves to make the fans enjoy themselves in games. I want to give 100 per cent, throw myself about and be that horrible striker for other teams to deal with. I enjoy it and it gives something back to the crowd. They have helped me through everything. Oakley’s period out of the team has coincided with a dry spell in front of goal, with four goals in their last six games that have all finished as draws. The former AFC Wimbledon striker does not like watching games at the best of times but the urge to get back on the pitch has been intensified by Caley Thistle’s struggle to find the net. Inverness’ defensive record is the second-best in the division, behind County, and avoiding defeat today would set a new club record of 23 games unbeaten. Oakley feels all the pieces are in place for a promotion push in the Highland capital – apart from goals.